I’m not a vegan, though I do sometime have meatless meals. I do, however, love Indian food. In the past, I’ve been brave enough to try a few Indian recipes at home from my Jamie Oliver cookbook, but Jamie Oliver is British, of course. 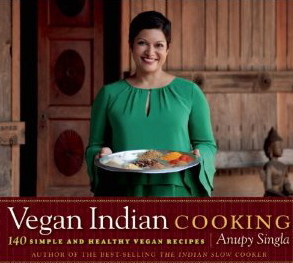 Anupy Singla – author of the new Vegan Indian Cooking – grew up eating vegetarian Indian dishes. And she dispels some common myths about Indian food, like that it’s “heavy.” Turns out only westernized Indian food has all that extra cream and oil. In her cookbook, which features 140 vegan recipes, Singla educates readers on the spices and other ingredients used in Indian cooking. Loaded with plenty of photos, Singla’s cookbook takes you through recipes for breakfast, soups, small plates, salads, sides, slow-cooked foods like beans and lentils, vegetables, rice dishes and one-pot meals, chutneys, drinks and more. Mother of two and former television reporter in Chicago, Singla decided to dedicate herself to learning how to create all of the Indian dishes she grew up eating. She blogs at Indian As Apple Pie. Check it out. As for me, I’m looking forward to trying some new Indian food recipes!